Incredibly stylish, premium-quality mid-calf sheepskin boots, made in New Zealand from genuine sheepskins tanned specifically for use as footwear. The side opening of these elegant boots have a button and elastic cord to make slipping them on and off quick and easy. 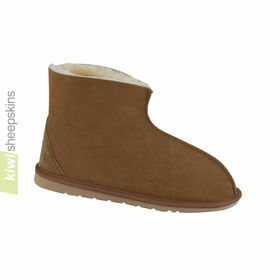 Reviews and feedback from customers who have purchased these sheepskin button boots (mid calf height). Thank you so much for these gorgeous boots I Love Them! They were on my feet in the UK a week after placing the order. They are both trendy & beautifully made. The sizing guide is spot on! My fourth pair of Kiwi boots over the years. Their customer service is second to none. 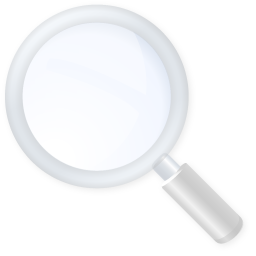 Any queries are dealt with quickly & professionally. I love my Mid Classic EVA button boots so much! They are beautiful. The sizing is perfect, thanks to your sizing instructions. I will certainly buy a tall boot next winter. 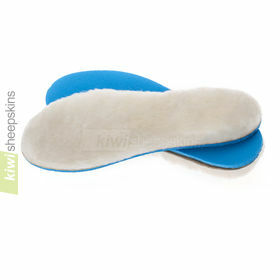 It is very important to me that they are made in New Zealand. Thank you! My order arrived today. When I came in with the mail I told my wife her boots have arrived. She had them out of my hands, opened and on her feet in a flash! After a long pause she looked up and smiled and said, "they are perrrrfect". You made me a HERO! We will be ordering more in the next few days for my wife and I. You sell a quality product and ship fast. Thank you. Just to let you the know the boots just arrived with the postie this morning. Jane is well pleased with them. As her arthritis steadily gets worse we look for items easier to get on her feet. These will make life easier for her. Thanks once again for a great service. Hi just to let you know that I have received the sheepskin boots I ordered. The delivery was very quick and I am very pleased with the product. 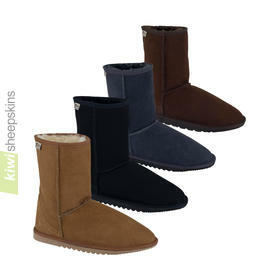 They are excellent value for money and easily match more expensive named 'uggs' which cost a lot more. My wife is extremely happy with her birthday present. I would also like to congratulate you on having Wales on your drop down menu and not just the UK. Diolch am Fawr (Thank you very much).